The CIA is implementing a device to sabotage the Annan plan and any attempt at peace in Syria. Reverting to its Cold War methods when it created subversive groups in the Eastern Bloc to infiltrate international combat fronts, the CIA organized a joint training seminar in Miami for members of the Cuban and Syrian armed opposition. 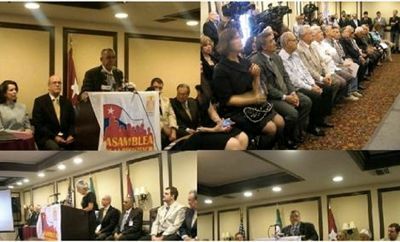 U.S. funded seminar of Cuban and Syrian armed opposition (1-8 May 2012 at the Biltmore Hotel in Coral Gables, Miami). “Syrian and Cuban resistance created a united front for the freedom and democracy of both peoples fighting against the ’dictatorial regimes’,” reported the Madrid agency correspondent in Miami, considered to be the base of all anti-Cuban plots in the U.S. Representatives of the “main Syrian opposition organization” and members of the so-called Assembly of the Cuban Resistance (CRA) of Miami, signed an “agreement to coordinate their efforts” and give Cuba an image of instability. “Syria has been caught in a spiral of violence since 15 March 2011, when thousands of people took to the streets,” added EFE. “This offers an extraordinary opportunity: a united front bringing the peoples of Syria and Cuba together to fight for freedom and democracy,” said Silvia Iriondo, the “president” of Mothers and Women Against Repression (MAR Por Cuba), in her interview with the EFE Miami correspondent. Silvia Iriondo, whose real name is Silvia Goudie, is the daughter of a mercenary who took part in the failed Bay of Pigs invasion. She is Miami where she lives off her lies and her “brainchild” M.A.R. Por Cuba, graciously funded by USAID. When Cuban 6-year-old Elian Gonzalez was kidnapped by his relatives in Miami, this lady and the members of her organization declared they would prefer to see him die rather than return him to his family in Cuba. The State Department and its “subsidiaries” have invariably employed her in their “foreign service” to participate in their meetings against Cuba, Europe and Latin America. In March 2004, Robert Ménard, the former secretary general of Reporters Without Borders, and Frank “Paquito” Calzon, CIA officer and director of the Center for a Free Cuba (CFC), appeared with her in public during a meeting with European MPs organized by friends of former Spanish Prime Minister Jose Maria Aznar at the European Union. Robert Ménard became famous after having replenished his “Cuban” bank accounts in Virginia with money from USAID, whereas at the CFC, Felipe Sixto, Calzon’s right-hand man, was arrested and convicted of embezzling half a million dollars. In 2007, the International Society for Human Rights – an openly anticommunist, CIA-run organization which organized a seminar on the “Cuban Problem” at the Dresden Bank Communications Center in Frankfurt, Germany – invited and seated Silvia Iriondo on the podium next to Calzon, Pedro V. Roig (Director of the Office of Cuba Broadcasting and responsible for the emission of Radio Martí and TV Martí, which was then under investigation for fraud), the “traitor Commander,” Hubert Matos, who is linked to drug trafficking, and Angel Serrano Francisco de Fana, a member of Alpha 66 (arrested in California in 1995 in possession of an arsenal of weapons slated to be deployed in a terrorist attack against Cuba). In November 2009, Silvia Iriondo together with the head of UnoAmérica, a fascist organization ideologically akin to Operation Condor, and Alejandro Peña Esclusa, currently on trial in Caracas for terrorism, was among the group of “observers” who legitimized the general elections held under the dictatorship of Roberto Micheletti in Honduras. On that occasion, she again rubbed elbows with Matos and other “figures” of the anti-Cuban mafia, such as the “anti-Castro” millionaire Orlando Gutierrez Boronat who is currently sharing her company at the “Cuba-Syria” fanfare. A recipient, like Ms. Iriondo, of generous dollar injections from USAID, Gutierrez anointed himself National Secretary of the Cuban Democratic Directorate (Directorio Democrático Cubano), and has even been accused by some of using his subsidies to travel around the world. Hailed by EFE, a news agency founded by the Franquist grandfather of Aznar, this “agreement” is not the first attempt to “associate” Cuba with Syria, in which Ms. Iriondo has been involved. A few weeks ago, this “activist” in the pay of the State Department participated in a briefing to Congress organized by a so-called Association of Cuban-American lawyers (CABA), centered on the theme of “The Arab Spring in Cuba,” in the presence mafia legislators Mario Diaz-Balart, Ileana Ros-Lehtinen and David Rivera. Among the signatories of the “agreement” acclaimed by EFE also appears Horacio Garcia, Council for the Freedom of Cuba (CLC) and a former director of the Cuban American National Foundation (CANF). It should be noted that this gentleman was publicly portrayed by Cuban-born terrorist Luis Posada Carriles as one of the major “financiers” of his criminal activities. For the “Syrian side,” EFE mentions Mohamed Kawam, of the so-called Syrian Emergency Task Force, and Niman Shukairy, affiliated to United for a Free Syria – doctor and dentist respectively – who seem to have more of a taste for easy money than to exercise their profession. Two Syrian activists based in the United States, whose right-wing positions enabled them to be closely associated with the State Department propaganda and destabilization mechanisms. 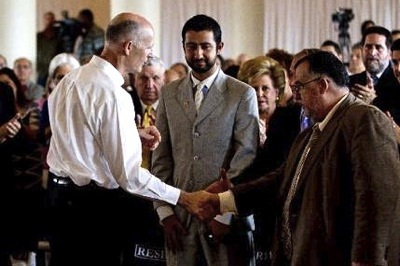 Reception for the Cuban-Syrian seminar participants given by the Florida Governor Rick Scott (1 May 2012). Therefore, the Cuban Resistance and the Syrian Revolution jointly declare: The people want the overthrow of the dictatorial regimes of Assad and Castro. Signed at the Biltmore Hotel in Coral Gables this 8th day of May, 2012. For the Syrian Revolution: Khaled Saleh (General Commission for the Revolution), Mohamed Kawam (Syrian Emergency Task Force — SETF), Yahia Basha (United for a free Syria — UFS), Bashar Lufti (American Syrian Public Affairs Committee —(AMSPAC), Imad Jandali (Syrian American Council — SAC), Maher Nana (Syrian Expatriates Organization —SSO— and Syrian Support Group — SSG). The ACR included Movimiento Feminista por los Derechos Civiles Rosa Parks, Coalición de Mujeres Cubano Americanas (Coalition of Cuban American Women), Proyecto Pro Cambio, Jóvenes Cubanos en Acción (Cuban Youth in Action), Presidio Político Histórico “Casa del Preso”, Directorio Democrático Cubano (Cuban Democratic Directorate), and MAR por Cuba (Mothers Against Repression).